Topsy-Turvy (Day three hundred thirty-five, originally uploaded by Madame Meow. Normally I change the name of the post from the original Flickr picture name. 5. 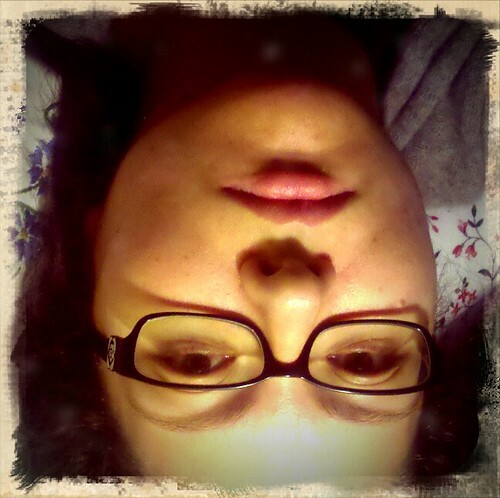 And that it seems I'm no longer afraid of showing you my face on here, as well, even if it's upside down. Live with it: I like this picture. You can always click through to Flickr if you would like to see my photoset lovingly and narcissistically called, "All About Me(ow)" if you would like. I've been remiss in writing, mostly because... well, we're going to have to hold off on that a little longer. Suffice it to say that I am still around, even if my life feels exactly like the picture implies: upside-down and topsy-turvy and not the way it used to be. But that's not bad. And, honestly, neither is this Hail Mary picture. It's just different, and that suits me fine. Now maybe I can update my About Me page before the end of the year. Ha! Who are we kidding here? Oh yeah! I was quoted in The Atlantic Wire! I'm still excited about that, so I am sharing my link here. Go read! Hope the peri-holidaze period is being kind to you all out there in BlogLand. PS: I need to write about my sidebar experiment, the 101 in 1001 deal. Let's just say I failed. PPS: Do you like me on Facebook? Yay! *hugs* Hope things are getting better and this is a good Christmas for you. I love that your cool post got linked. You rock! The attention is well-deserved. I like the photo, too. Merry Christmas!! Hope you have a great day.